Running on Pixie Dust: Why B-less When You Can B-more? Why B-less When You Can B-more? This week marks the 15th anniversary of the Baltimore Running Festival and I'm excited to be joining the fun for the first time. 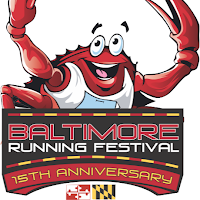 The big day includes a 5K, Half Marathon, Marathon Relay, and Full Marathon which are all preceded be an expo spanning two days at M&T Bank Stadium - Home of the Baltimore Ravens. I'll be running the 5K on Saturday morning as a "big race" tune up for the Wine and Dine Half Marathon next month. The last time I ran a large scale race was back in May 2014 during the Frederick Running Festival and Baltimore promises to be even bigger. Hopefully the field of roughly 4,500 5K runners will begin to slightly prepare me for the almost 15,000 runners I'll be joining in Orlando in November. If you're interested in following along with the festival activities this week, check out #BaltRunFest, #RunHon, and #RunforPride on social media. I'll be sharing pictures and tweets throughout the week @dsnyrunrgrl and here on the blog too!